Tool & Assembly has a team of sales technicians that can help you understand the fastening process and spec out the right tool for your application. We will also provide ergonomic solutions to reduce or eliminate operator fatigue. 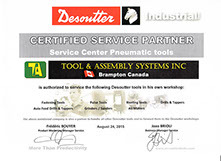 Torque Seminars are available upon request and can be conducted either at your facility or at ours. These seminars will break down the fastening process and help you understand the bolted joint and obtain the knowledge required to generate application specific tolerances when it comes to tightening and torque. Tool & Assembly has a complete laboratory featuring all the equipment we sell. Within this lab we can perform torque destructive testing and yield analysis. Our testing and lab report will help you to understand what is happening with your process.